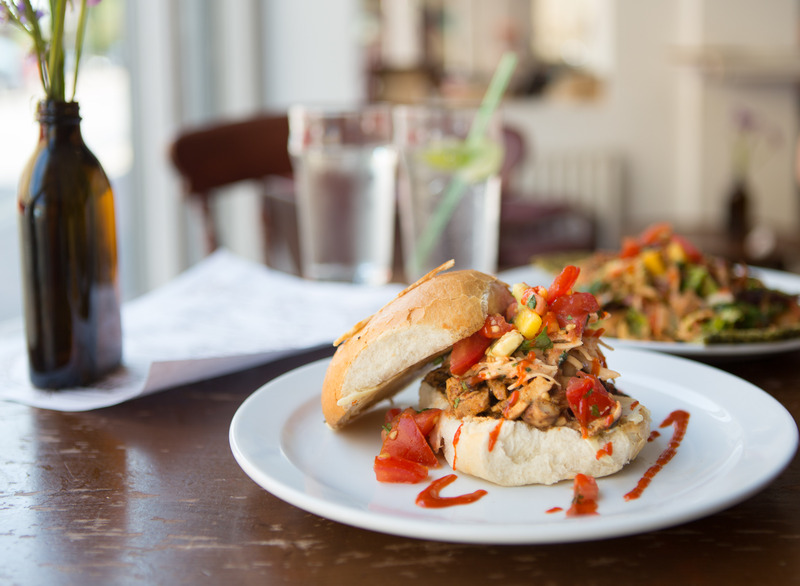 Tying Lousiana Creole to the influences of Caribbean Creole cooking available in Brixton with the mix of Colombian, Triniadian and Jamaican food, Richard’s cooking introduces lesser known elements of American cuisine such as waffles and po’boys. These are a famed sandwich from New Orleans which were cheap enough for everyone to eat and filling enough to be your only meal of the day. Richard’s are a neater size that don’t spill down your front, but they capture the detail, flavour and delicious French inspired bread of a proper po’boy. Waffles come both sweet and savoury. I particularly enjoy a plate of savoury ones topped with jamabalaya, a Cajun stew of chicken, shrimp,sausage and hot sauce followed by the legendary Bananas Foster ones with caramelised banana and ice cream so I don’t have to make difficult choices for lunch. Choice is the name of the game though. The menu looks simple, but there are 5 choices of base including roti and a chopped salad and then 5 or 6 choices of topping including jerk chicken, grilled vegetables and soft shell crab. This allows you to mix and match to your heart’s content or do a fabulous platter that almost defeated three of us when we lunched there this week. Everything is freshly prepared and fantastic quality and sourced from the market where possible. Richard knows how to get the best from vegetables with everything on the plate packed with flavour and used creatively. The fish and seafood is top quality and I’ve been dreaming about the light crispy crunchy crab ever since. It’s hard to believe they are offering the main meals at £5-6 each and the platters at £12.95 with this much attention to detail. Richard is on a mission to get the people of Brixton eating well and interacting with their food. He’s brought Southern hospitality to the laid back vibe of Kaff and the place is packed during the day with people working from there over well priced tea and coffees and at night it’s a great venue for eating as you sample their excellent cocktails. The large windows make for great people watching that indulges my noseyness as well as my appetite. Food becomes social in Richard’s kitchen with monthly crawfish boils accompanied by live music and Bank Holiday specials. If you enjoy seafood, a plate of what we know as crayfish, a big bottle of hot sauce, a bib and some NOLA inspired tunes has to be the best night in Brixton. Just don’t wear your best shirt! Kaff has proved to be a very welcome addition to that stretch of Atlantic Road with Steve and his team providing good drinks, great atmosphere and fun events such as Cake Club, but Richard’s food takes it up a notch for me. Delieious, a bit different and consistently good quality, it’s getting mildly embarassing how often I’m in there to eat. Just make sure you leave a seat for me and my fish tacos when you go!